A fun twist on regular tacos. 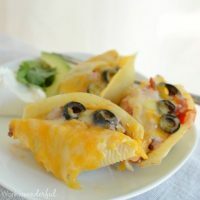 These Taco Stuffed Pasta Shells will be a new family favorite dinner recipe! Taco Tuesday just got a little more interesting! 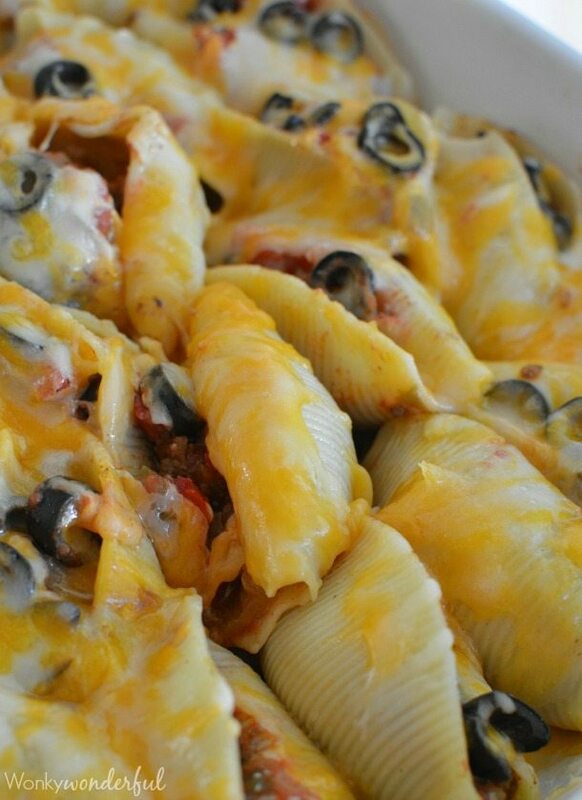 Taco Stuffed Pasta Shells are easy, delicious and budget friendly. And you can save even more money with the Walmart Savings Catcher! I am really excited about this app. 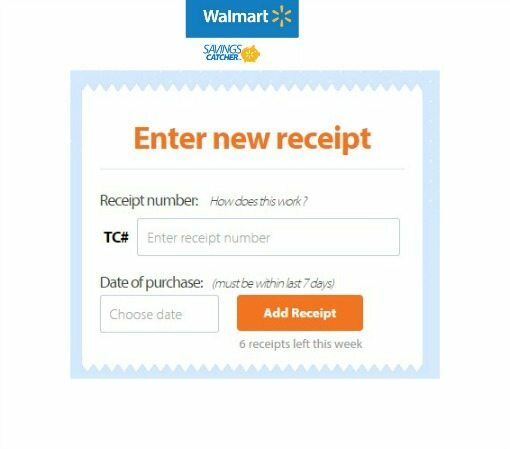 Basically, if a local competitor offers a lower advertised price on an item you purchase at Walmart, Savings Catcher allows you to get back the difference. The Savings Catcher Reward Dollars can then be redeemed for a Walmart Rewards eGift Card or added to your Bluebird by American Express Card. I know how I’m paying for Christmas this year! I saved $1.94 on this quick trip to Walmart. That adds up! So when you head to Walmart to pick up the ingredients for these Taco Stuffed Pasta Shells, save your receipt! 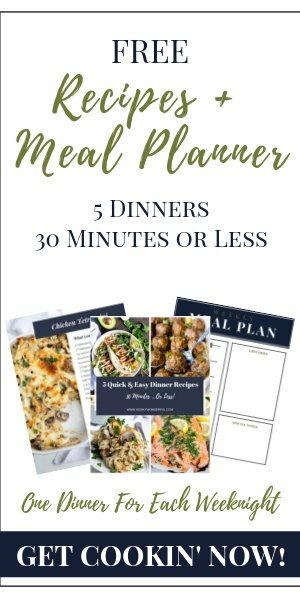 You get to eat this satisfying dinner AND save money! Two of my favorite things. Begin heating a large pot of water to boiling. Add pasta shells to boiling water. (add a drizzle of olive oil to prevent pasta from sticking) Cook pasta 2 minutes less than package instructions. Drain and let cool. Brown ground beef in large skillet. Drain grease and return meat to skillet. Add taco season, water and green chiles. Heat over medium/low until liquid is absorbed. Fill pasta shells with a large spoonful of meat and a small spoonful of salsa. Pack shells tightly and in an even layer in a 9x13 baking dish. Top each shell with 2-3 sliced olives. Cover shells with shredded cheese. Bake for 10-15 minutes or until heated through and cheese is melted. Serve with sour cream, salsa, sliced avocado and fresh cilantro. 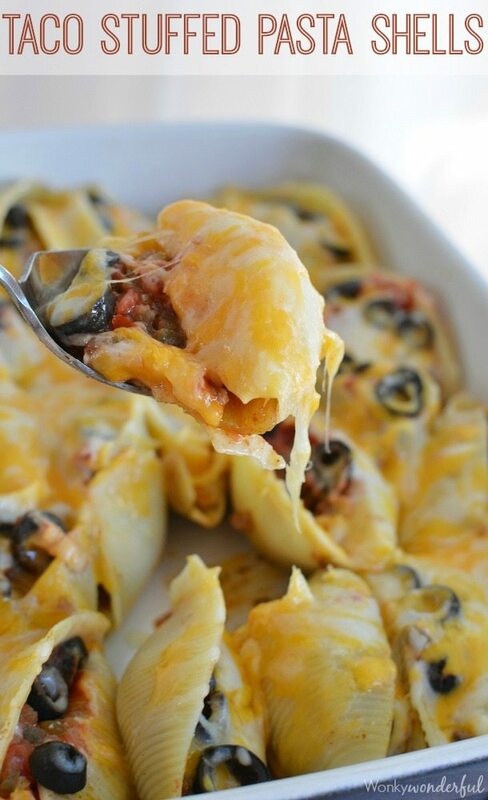 Taco Stuffed Pasta Shells. Stuff, Cheese, Bake. As easy as 1-2-3! I always see the savings catcher online and wonder what it’s all about! I need to try it! I also need to try these shells because, well, THAT CHEESE! Pinned! Needs a sauce. Maybe enchilada sauce? Hi Elle! I debated on adding a sauce but decided to keep it plain. You can definitely add an enchilada sauce if you prefer. I’m sure it will be fantastic! I have been following your pins for quite a while and I wanted to say that I am so impressed with your photography! You photos just keep getting yummier!! Thanks so much for the kind comment, Sandy! We had these tonight for a family Easter dinner and we were split on them. Personally I really liked these, however I did modify for my family’s taste. I used super lean ground turkey instead of beef and used a pack of low sodium taco seasoning mix. I was lazy and just topped the stuffed shells with a healthy spoonful of fresh salsa on each shell, then sprinkled black olives over the top. My pound of turkey filled 24 shells. Because of timing for the rest of the meal, I cooked at a lower temp for a bit longer, delaying the addition of the light Mexican cheese on top until the last 10 minutes or so. We all added sour cream and green onions on top. We will have these again! Nice recipe and easy to customize for your family’s taste.